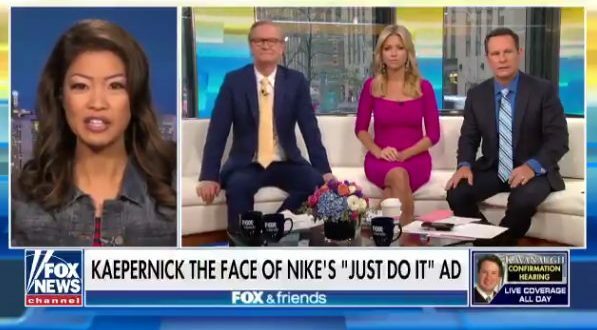 Fox & Friends Guest Michelle Malkin Condemns Nike For "Becoming A Social Justice Corporation" [VIDEO] - Joe.My.God. “I am no longer astonished by the tone deafness of so much of corporate America. It looks like Nike wants to follow in the NFL’s footsteps and alienate half of its consumer base. There are so many people across this country who feel very deeply that we should stand for the flag and kneel for our god and the fallen. I’d like to see an athletic branding company put that on a t-shirt and sell it. “Nike used to be a company that celebrated athletic excellence and now they have become a social justice corporation. They’re trying to fashion him [Kaepernick] as some sort of civil rights leader on the order of Martin Luther King, or even Malcolm X, or Gandhi? What is it that he believes in?” – Michelle Malkin, on Fox & Friends this morning.